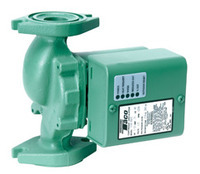 The versatile Setpoint version of the Variable Speed â€œ00â€ can be set up to deliver a fixed temperature, maintain a specific temperature drop between sensor locations (DT), used as a bypass/shunt pump, or integrated into a fan coil package to vary the speed of the pump based on supply air temperature. The 00-VS can be either direct-acting (speed increases on a temperature decrease) or reverse-acting (speed increases on a temperature increase). A typical direct-acting (limiting setpoint) application would be for boiler protection, where the 00-VS is installed on a bypass loop. If the return temperature starts to drop below the set temperature (75°- 165°F), then the speed of the pump will be increased, bypassing hot water to protect the boiler. The 00-VS can be used in radiant injection mixing systems where you want to set a fixed supply-water temperature. Through the use of the setpoint dial on the PC board, you can select any temperature from 30°-210°F. If desired, a boiler protection sensor can be installed to protect the boiler from flue gas condensation. In the DT mode, the pump speed is varied to maintain a set temperature drop (5°-50°F) across a boiler or heat exchanger, ideal for snowmelt applications.